I am not your typically girly-girl. When I was growing up, I had two older brothers who were more of an influence on me than my older sister was (I think I was just rebelling against her, because you know, sisters). I ended up in this strange space somewhere between tomboy and girly, and it wasn’t until I was an adult that I started openly indulging my feminine side. In this day and age, we have so many options for our little girls, and not all of them are overly girly. This is great for me, considering I grew up in a room plastered with 80’s floral wallpaper that I hated (click here for floral wallpaper that I do not hate). I begged my parents to remove that wallpaper for years. So now that I’m a nursery designer, and an adult, I have so many more places to look for girl’s nursery inspiration. When I’m working with a new client on a girl’s nursery, I usually have them send me a few of their own inspiration photos first. These are typically from Pinterest or Instagram. That gives me an idea of what my client’s style is, in addition to a lengthly questionnaire I have them fill out. Then I scour my own sources for more inspiration which will help me pull together my design concept. 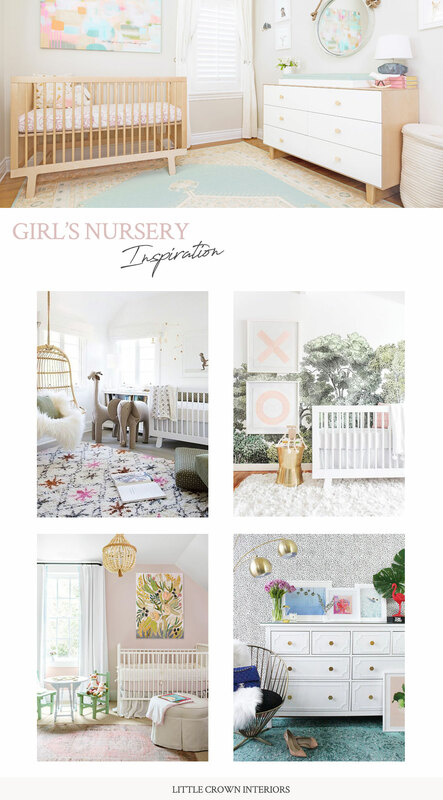 Pinterest and Instagram are pretty great, but I have some other sources that I like to visit to find girl’s nursery inspiration that you might not have thought of. 1. PINTEREST. I like to start with the photos that I’ve already saved. I do so much online shopping and sourcing for my clients, that I find all sorts of great furniture and decor and just pin it to look at later. If you follow me on Pinterest, you’ll see that I have a ton of nursery inspiration as well as kid’s, furniture, decor, etc. 2. INSTAGRAM. I follow so many nursery decor brands, furniture vendors, bloggers, etc., that my feed is pretty much a constant stream of nursery inspiration. If you don’t know who to follow, you can always cheat and just follow my account and then see who I follow. A few of my favorite accounts that post a lot of nurseries are @projectnursery, @babyletto and @decor_for_kids. 3. “REGULAR” INTERIOR DESIGN. I’ve talked about this a lot. There is no reason that you can’t take nursery inspiration from a photo of “adult” interior design. Even if there is no crib or juvenile elements in a space, you can still take inspiration from the color scheme, furniture style, and other design elements. Take the image below—can’t you just imagine how cool that wallpaper would be in a nursery? Paired with a pink velvet glider? If you can’t visualize it, check out my post where I created an entire nursery design board inspired by this living room space. 4. DESIGN SEEDS. I absolutely love browsing this website. A girl’s nursery doesn’t have to be limited to pink tones. Design Seeds has every color combination under the sun, and it’s all organized in a way that will make sense to your brain. If you have trouble visualizing how colors will go together, definitely take a look at this site. 5. ARCHITECTURE. I’ve always been a bit of an architecture nerd ever since I started learning about it in design school. It was always so incredible to me how architecture has helped shape human history, and how it says so much about humanity in general. Because of the sheer size and scope of architectural works, they have the ability to be truly awe-inspiring. I love taking design inspiration from beautiful buildings, like this gorgeous pastel spot in Poland. 6. MY OWN PAST WORK. This might seem strange, but I consult my own interior design portfolio all the time. Since I know the ins and outs of how each design went together, I also know what worked and what didn’t, what was easy and what was difficult, and what my clients liked the best. This gives me tremendous insight into my future projects! Plus, it’s hard to keep track of every single item I’ve ever used, so seeing them again in my nursery photos helps to spark my memory. Inspiration is everywhere, absolutely everywhere. 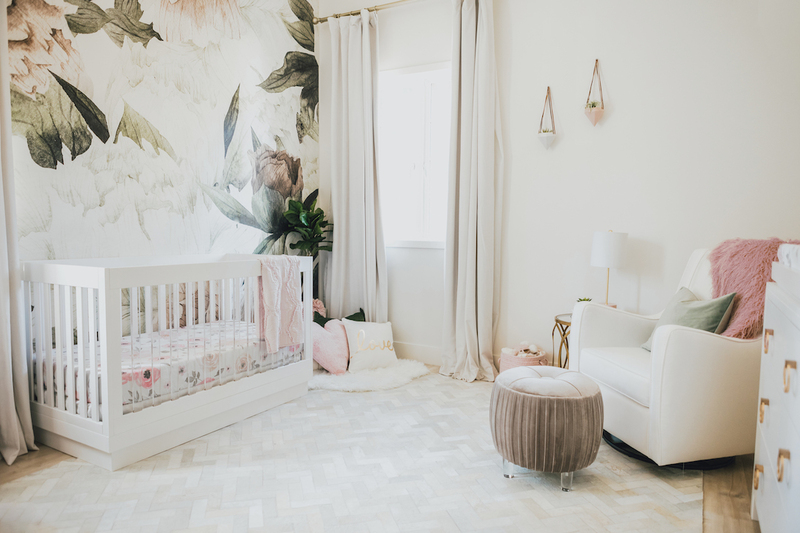 That said, if you’re still having trouble finding the right nursery inspiration, or you just want some guidance, check out my nursery design services. It doesn’t matter what your budget is, or where you live. I have service levels for everyone!